Review | What's the best way to be the very first to drive the all-new Toyota Prius plug-in? Exactly! Travel to Japan to get this green machine directly from the factory. But... what is the difference between this and the regular Prius? And while we're in Japan anyway, what's it like to drive an electric car there? Why are we so eager to get our hands on the wheel of the new Toyota Prius plug-in? Because the Prius has caused somewhat of a revolution in the automotive industry over the last few years. It's well worth a journey to Japan to experience the next step in that revolution. The revolution started in 1997. Toyota realised it was necessary to reduce the use of fossil fuels and ultimately reduce emissions to zero. However, the market and the technology were not ready for a full electric car. It was obvious that an electric motor is the most efficient solution for short distances and stop-and-go traffic. However, the limited range and astronomic price of batteries made an electric car an impossibility back then. Toyota did realise that an "intermediate" vehicle was a possibilty! 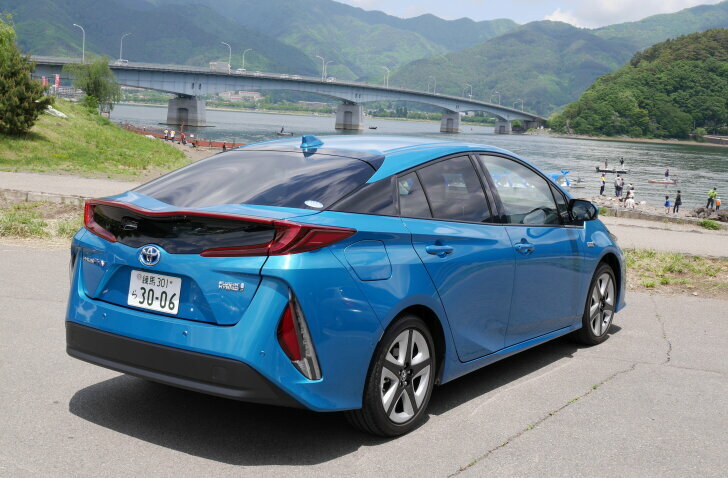 The Prius ("forerunner") combines an electric motor and a petrol engine in one vehicle. Clever mechanics ensure smooth transition from one power-train to the other. Also, both engines can combine their power for maximum performance, if so required. The result is a quick, comfortable car that uses roughly half the fuel of a conventional car of the same caliber. In 2016 Toyota introduced the fourth generation of the Prius. The two engines work in even closer harmony than before for more refinement and comfort. And, for the first time since the introduction of the Toyota hybrid, the Prius is exciting and fun to drive. 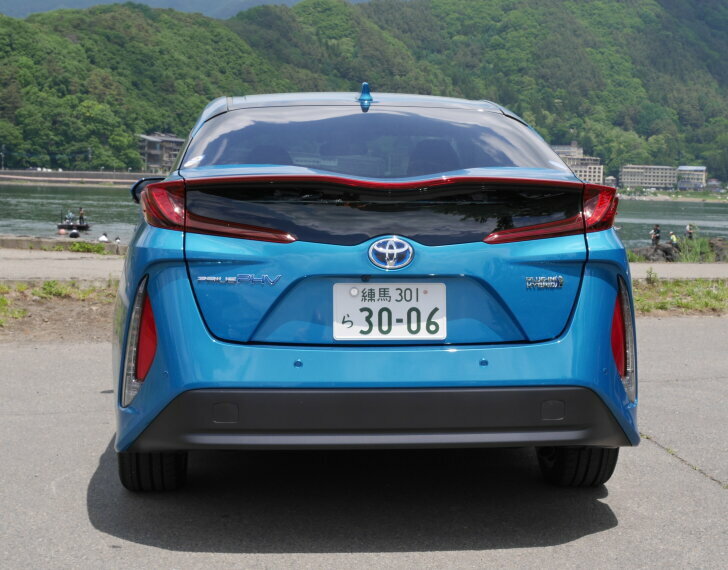 The same goes for the Prius plug-in, but the 250 kg extra weight of the batteries does affect handling. The balance in the underpinning isn't quite as good because the batteries aren't mounted in the floor but rather under the boot (above the rear axle). This affects the dynamics and agility of the car. While the regular Prius handles better than the average car in this segment, the Prius plug-in scores a mere "pass". Another difference is in the boot space, which measures 512 litres for the regular Prius and 360 litres for the plug-in hybrid. The floor has been raised and the gap between the floor and the rear bumper has been used to store the charging cables. The space on the back seat remained the same; even with two adults in the front, ample space remains in the rear for another two adults. The spec levels of the Prius hybrid and plug-in hybrid are basically the same. That means that the car offers all the luxury and safety features one expects from a modern car in this segment. The wide and narrow display under the windscreen is pleasant to use because all the necessary information is right in the view of the driver. The Japanese version also features a huge, vertically mounted screen in the centre console (comparable to Tesla), but Europe has to do with a modest, horizontal 7-inch display. Unique to the plug-in hybrid is the optional solar panel roof, which can power the air conditioning while the car is parked. In theory it could also charge the batteries, but this would take so long that moss would be growing on the roof! 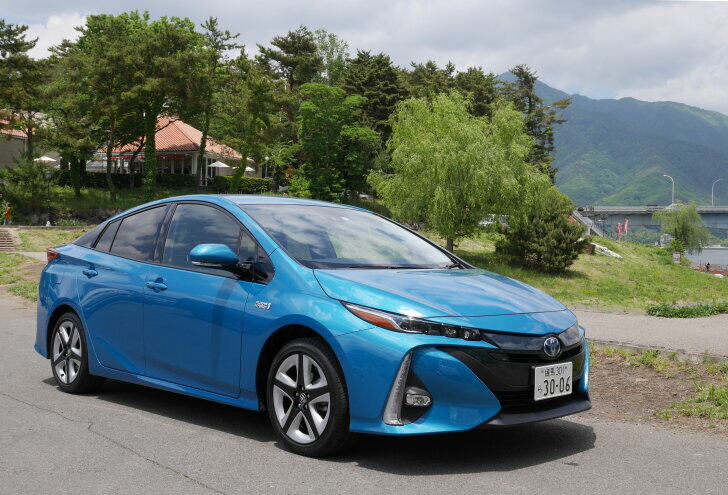 The big difference between the regular Prius hybrid and the plug-in hybrid ("PHV") is the way the electricity for the electric motor is generated. In both cases, while braking or "sailing", kinetic energy is converted into electricity. Next to that, the plug-in can be charged via a... plug! This takes 2 hours using a public charging point or 3 hours via the wall-plug at home. After that, the Prius can cover 50 kms electrically (20 km for the previous generation) and that's enough for the average daily commute. The internal combustion engine is merely a "backup" engine which takes over when the batteries are drained. 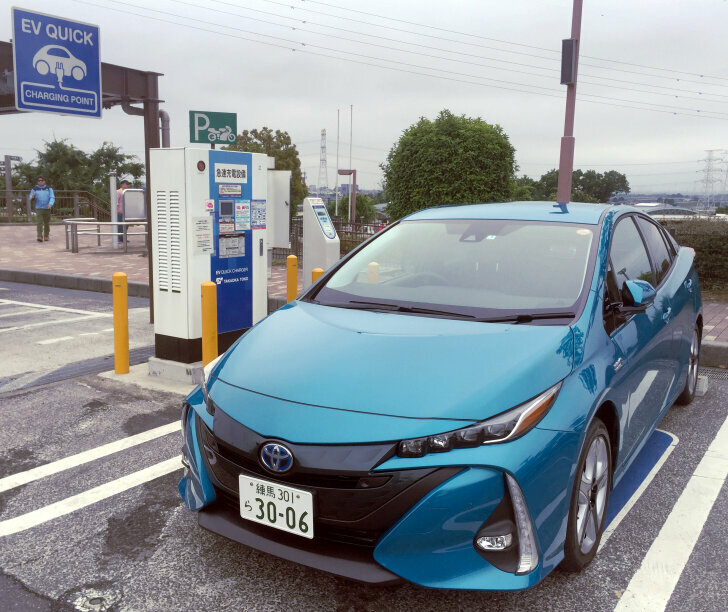 The difference with a so-called "range extender" is that the driver of the Prius plug-in can choose when to drive electrically and when to drive in hybrid mode. Just like with any other Prius, the engines work together like a well-oiled machine. And when both engines combine their power, the Prius is quite spritely. In theory the plug-in is a tad slower than the regular Prius, but in practice this is hardly noticeable. However... because the plug-in will be driven in full electric mode more frequently and for longer periods of time, the difference between both engines is more noticeable. In full electric mode the Prius plug-in is free of any kind of vibration and the engine is extremely smooth and torque strong. When, after 40 or 50 km the electric fun ends, it feels like a real setback. The perfect silence is broken and it feels like the car fights a strong headwind all the time. Which is an extra incentive to quickly find a charging point! In Europe this is confusing because of the competing charging companies, different cables and incompatble plugs. In Japan a new dimension to the confusion is added: a language barrier. However, because Japanese carmakers set a Japanese standard for charging plugs and cables, it is supported everywhere. Also, there is only one form of payment (plus credit cards for the occasional motoring journalist or rental car driver). Along the highway, about half of all the fuel stations and car parks offer charging points for electric cars, and they seem to be in use pretty much all the time. Many hotels also offer charging services to their guests, which we used gratefully. Except for the language barrier, charging an electric car is easier than in the UK. And that's why one wonders: why is the Prius only available as a hybrid vehicle? 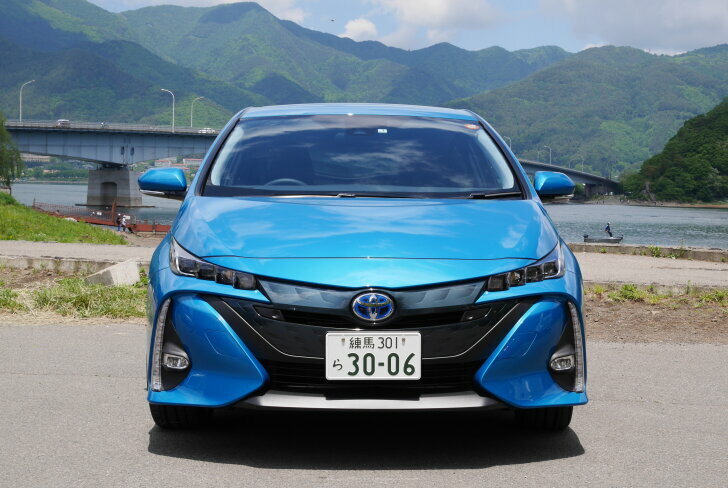 By now, other carmakers proved that affordable electric cars can offer a usable range, but Toyota still clings to the "halfway solution". Having said that, the "halfway solution" drives very well. The test drive spanned from the east coast of Japan (Tokyo) to the west coast (Toyama) and back. This journey of almost a thousand kilometres could be covered on a single tank of fuel. And that is the true power of hybrid technology. And, when charged frequently, the plug-in hybrid is even more frugal. 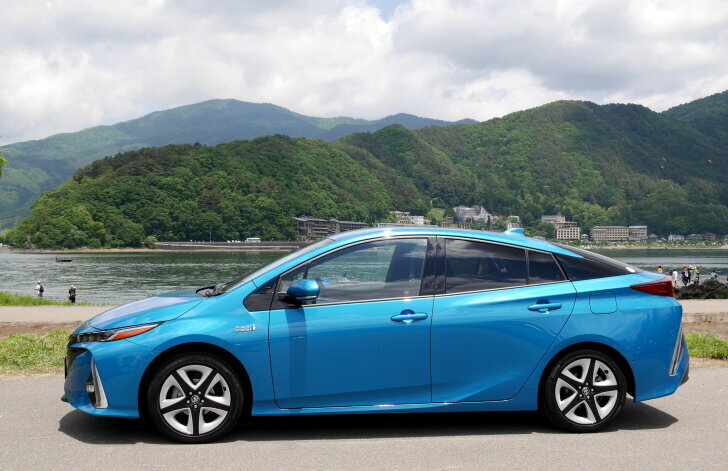 The fourth generation of the Toyota Prius is now available as a plug-in hybrid. That's good news and bad news. To start with the bad news: the extra weight of the batteries affects handling and the driving fun that's characteristic for this generation of the Prius is lacking. Also, the boot is less spacious. The good news is that the Prius plug-in is even more efficient than a regular Prius. That is: when every opportunity is taken to charge the batteries. Then, about 50 km can be covered in full electric mode and the Prius uses no fuel at all on the daily commute. At the same time, the plug-in Prius is far more comfortable than the regular Prius. Thanks to the bigger "oomph" of the hybrid drive, huge distances can be covered with great ease. Finally, driving an electric car in Japan is easier than in Europe. Because there's only one plug and one method of payment, there's less confusion. Also, the large number of charging points show that Japan is ready for the electric car.